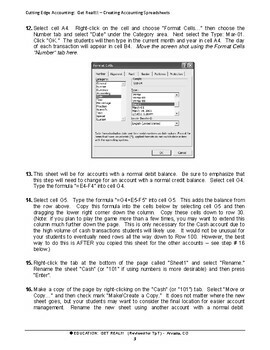 ACCOUNTING – FINANCIAL LITERACY: "Spreadsheet Activity for Accounting Students" is a three-day activity which assists students as they learn how to prepare financial documents using technology. This activity is included in the “ACCOUNTING & FINANCIAL LITERACY "Monopoly - Reinforcing Accounting Principles" BUNDLE also offered here in our store on TpT. NOTE: This is a "how-to" set up a spreadsheet only. It does not include practice activities or an answer key. Auditing the accuracy of this activity can be a fun exercise - teacher dictates numbers to input. If the formulas are correct, students will agree; if not, students need to proofread and find their error! Switching places works well, too. PLEASE IMPLEMENT THIS PRODUCT IN YOUR CLASSROOM BEFORE Y0U RATE THE QUALITY AND JUDGE THE CONTENT. OTHERWISE, IT IS UNFAIR TO THE AUTHOR WHO HAS SPENT COUNTLESS HOURS PREPARING A HIGH-QUALITY PRODUCT TO SAVE YOU TIME, WORK, AND $$$$'S! IT ALSO GIVES YOU THE OPPORTUNITY TO PROVIDE THE AUTHOR VALID AND VIABLE FEEDBACK SO THEY CAN IMPROVE AND UPDATE THE PRODUCT TO MAKE IT BETTER FOR STUDENTS. EGR ALWAYS STRIVES FOR EXCELLENCE IN EDUCATION. We thank you!Would you like to bring more technology into your accounting class(es)? Would you like to incorporate more technology into financial literacy? Why not introduce spreadsheets the students can prepare themselves? 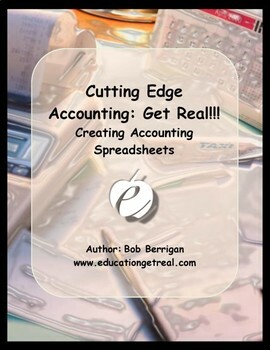 The Cutting Edge Accounting: Get Real!!! 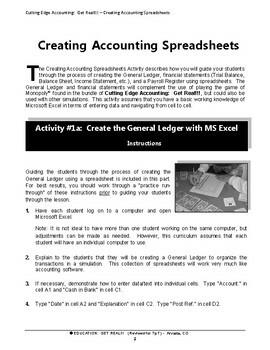 Creating Accounting Spreadsheets Activity instructs the teacher and students to build financial statements for financial problems in accounting simulations, bookkeeping/recordkeeping, financial literacy, personal finance, and more! 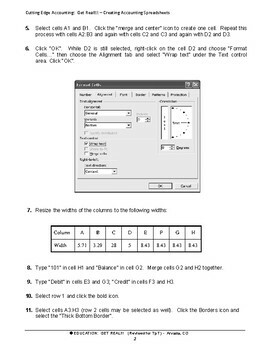 This activity assumes that you (the teacher) have a basic working knowledge of Microsoft Excel in terms of entering data and navigating from cell to cell. This three-day activity gives the teacher complete instructions and activities to present to students for building and inputting financial data onto a spreadsheet. Listed below are links to a secondary Cutting Edge component plus a description of the BUNDLE -- all of which may be of interest to you as well. Click the item to open the link in a new window. Keywords: monopoly, simulation, role of the dice, dice, spreadsheets, payroll, accounting cycle, integration, secondary, home school, math, CTE, financial, finances, game, job skill, money, technology, computers, Excel, Worksheet, trial balance, income statement, owner's equity, balance sheet, payroll register, accounting spreadsheets, national business standards, monopoly rubric, payroll rubric, T accounts, general journal, general ledger, cash receipts journal, payroll register, subsidiary leger, cash payments journal, trial balance, secondary, Education Get Real, EGR.